A nice length for layering. This shelf bra cami is great for wearing under other garments. Women's Sizing. The clasps at the top are designed for very easy one handed release. 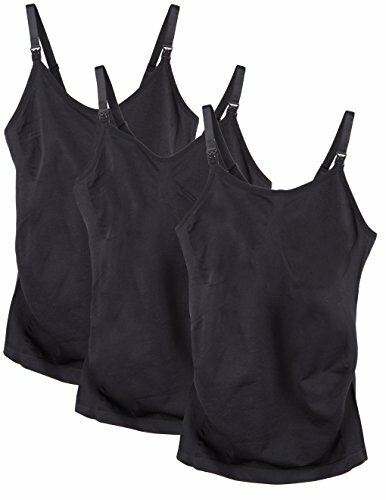 Keep in mind these are not intended for strenuous (or medium level) activity (sorry ladies no yoga in these camis without the clips coming unclipped). They are very much intended for nursing and the mom who needs one handed release abilities. Straps are 5/8 inch wide. The XL has a back length of 20 inches. The Medium size has a back length of 17.5 inches. Wear them in or layer them up and wear them out. A great cami for wearing during or post pregnancy. The model is wearing a Medium she wears a 32E bra and is 5 feet 8 inches tall. Her bust measurement is 36.5 inch bust, 32 inch over bust and a height of 5 feet 8 inches. You can see it's baggy in the mid section for post pregnancy. She could have easily gone with a size Small. So a little hug or shaper effect during pregnancy not a lot of shaping after pregnancy unless you order a size down. Sizing: Small fits sizes 0-4 best. Medium fits sizes 6 and 8 best. However a size 10 women should be able to fit in the Medium as well (especially if you want more shaping). If you're looking for more of a layering piece (that is you're a size 10 and don't want the "hug" effect) then you could size up to a Large. Keep in mind you'll need to fill out the cups in order for the clips to stay clipped. (ie- if you have smaller tatas the clips come unclipped much easier). Size X-Large is recommended for the 12/14/16 customer. Keeping in mind the size 16 customer will get a much firmer "hug" or shaping effect then the size 12 customer. If you have any questions about this product by Caramel Cantina, contact us by completing and submitting the form below. If you are looking for a specif part number, please include it with your message.